The worm has been turned away. 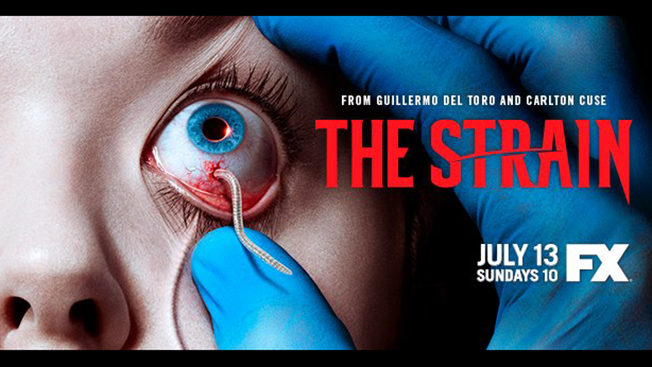 Billboards for FX's The Strain, with creepy critters crawling out of (or perhaps boring into?) human eyeballs, are apparently too much for some folks to bear, and the cable network says it is replacing the ads in several locations—the signs have run in Los Angeles and New York—with less-upsetting imagery. The series was hatched by director Guillermo del Toro and writer Chuck Hogan and slithers onto TV screens July 13. It's a medical thriller about parasites that turn New Yorkers into monsters. So far, the eyeball campaign had generated its share of angry parents and motorists but hasn't precipitated any lawsuits. The same can't be said for last year's eerie "Dexter" takeover in Grand Central Terminal, which generated a complaint from a Bronx woman who claims that the "shocking and menacing" promo caused her to slip on a stairway and sustain an injury. The Strain's ad controversy is generating plenty of buzz for the show. So if you subscribe to the theory that there's no such thing as bad publicity, these wormy posters have hit pay dirt. I guess NO WORMS CRAWLING OUT OF EYEBALLS ON BILLBOARDS PLEASE was a thing that needed to be said explicitly?